Dolce embraces a deceptively simple philosophy: the pursuit of perfection in the art of late harvest winemaking. Created in 1985 by the partners of Far Niente, its existence is the result of overcoming remarkable adversity and developing expertise where no one else in the U.S. had it. Dolce stands as the pinnacle, where Mother Nature and craftsmanship combine to define luxury through a wine capable of flirting with your emotions like no other. With a classic blend of late harvest Semillon and Sauvignon Blanc, Dolce is the only American winery dedicated to producing a single late harvest wine. Dolce has brought forth a wine in every vintage, yet in small, unpredictable quantities; witness to the incredible difficulties presented every year in the effort to make Dolce. Dolce is an extraordinary wine bred from a combination of sunshine, soil, fog, expertise and dedication; a wondrous luxury, limited by nature to always being a gift of absurd rarity. The Dolce cellar is located within the caves of its sister winery, Far Niente, in California's Napa Valley. Visitors to the winery are welcomed with a hosted tour, followed by a tasting of current and library vintages. Visits are by appointment, only. View from Tasting Room: We are on the west side of Napa Valley and have a lovely view of the east side. Food Available: Wine tasting with cheese pairing. 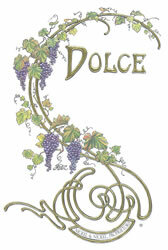 To join the wine club, visit www.dolcewine.com or call 707-944-8868. “Dolce Far Niente,” the Italian phrase meaning, “It’s sweet doing nothing,” describes a way of enjoying life’s passions, without a care. It is a phrase that embodies the spirit of the Far Niente, Dolce and Nickel & Nickel wineries. We invite you to become a patron of the Dolce Far Niente Society, a club comprised of enthusiasts of the Far Niente family of wineries. It’s our way of bringing a touch of Dolce Far Niente to you throughout the year. -Four quarterly shipments, including three bottles of wine consisting of a combination of Far Niente, Dolce and/or Nickel & Nickel. The price is $230-$250 per shipment, plus delivery and tax where applicable. Shipments may include advance and current vintages, as well as offerings from the Far Niente Cave Collection library. -A 20 percent discount on the additional purchase of the featured wines for 30 days after each shipment. -A 15 percent discount on additional purchases of wine anytime from Far Niente, Dolce and Nickel & Nickel, in person or by phone. -Complimentary VIP tours and tastings by appointment at the private Far Niente winery, as well as at Nickel & Nickel. Members may be joined by two guests for the tours and tastings. -Invitations to exclusive, patron-only winery events and programs at Far Niente and Nickel & Nickel. -A subscription to the quarterly Far Niente Family eNewsletter, which will keep you up-to-date on the latest news and events at the Far Niente, Nickel & Nickel and Dolce wineries. Ask a winery associate to begin your membership either in person at the winery, or by calling Far Niente at 800-FN-DOLCE (800-363-6523).